Here is a Wenger knife that I finally got in my collection. It is a RangerGrip 74.821 or 1 77 74 821X. This is probably the most interesting one that includes the pliers. This got the best balance in tool selection and thickness. This knife is a MultiTool! I have no doubt that this is a MultiTool designed for the outdoors. This is the key philosophy of this knife with a guarantee. There are different categories of tools in the world designed for the outdoors and a complete tool for everything is difficult unless you go for the largest and the ones with the most functions. 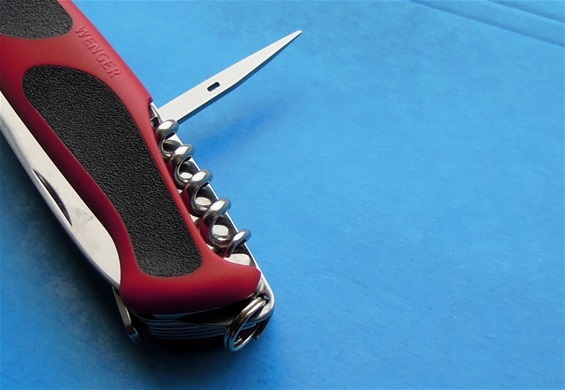 This RangerGrip can be called a MultiTool in my mind because of the selection of tools together with the plier and blade. This RangerGrip is the one that did it very well in the Villmarksliv test together with the best MultiTools in the world. Please take the time to read about my pages on the New Rangers. If you add a wood saw to this configuration then you enter a new level on tools. To have a large saw will increase the versatile use by much. It is so that on the average needs this RangerGrip is enough for sure. If you read on the New Ranger pages then you can see that the Hex opening used on some of them is a genius addition that can take the MultiTool into the next higher level. It depends on the need. It is fully possible to custom make a pack and if one is extra smart use combination tools that I have been discussing so much. It is so that a MultiTool is supposed to be all in one pack and yes that is the idea. It depends on the need. The highest level of a MultiTool is when 100% of the functions you need are in one Pack. It is absolutely very difficult in some situations and sometimes you will need a combination tool to be able to do a task. 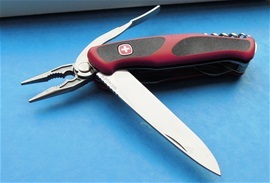 It is also important that for situations that require a blade for rescue then you will have to get a OHT blade as well. There is no hex opening possibility on this knife, it is a minimalistic set of tools with maximal size. This is an advantage with the Ranger knives. I do believe the MultiTool phenomenon is only in its beginning! Two of the most used functions for fishing are a blade and pliers. The plier is very handy for removing the hook from a fish. The large blade on this knife is very good for work on fish. Because it is a locking blade is it secure and safe for work on fish. 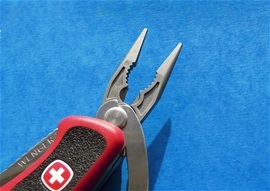 The screwdriver can be used on fishing gear or equipment. One of the factors that are extra interesting is how to improvise with the functions available. 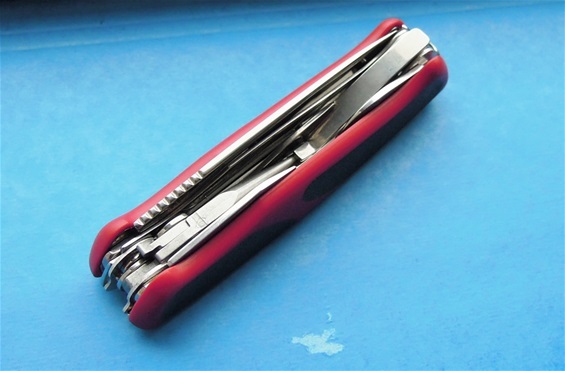 The awl and can opener can be used for much more tasks and so on. Take a look on my New Ranger pages with under-pages and SwissTools page with under-pages. Combinations are fun! 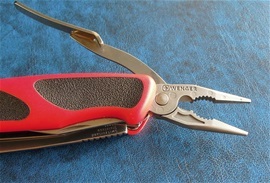 Wenger made a pliers for the outdoors and with a construction that i recommend looking closer on. The use of springs and the mechanic precision are outstanding. It is only the best Companies in the world that can do this. The pliers used on the 130mm category is interesting for sure. Sandvich spring design construction used on SAKs and the Wenger 130mm category. versatile mind and versatile knife! Remember that a minimalistic set of tools or functions can be maximal for many because people can improvise and that the functions on a SAK can be used for much more than the name or design may seem at first. It is in the SAK philosophy that one screwdriver can be used for much more and I do believe each function can be used for at least 100 things. A plier for fishing is the most important function together with the blade. To remove the hook from a fish then you will need a device, some fish have small sharp teeth and some do not. I have never had any luck with using gloves for this. The best is a plier or the hook disgorger function you find on traditional SAKs. No doubt the plier works best. It is possible to make one of wood too. To remove the hook is important for two reasons, either to release the fish again or to reuse the angle or lure. Especially today it is important to have in mind that some fish are too small and must be released by law. It is important then that the fish will be able to live afterwards with the little as possible injury on it. The pliers are needed for a controlled hook release. For smaller fish the needle nose pliers works the best. For large fish the blunt nose with wide construction works best. 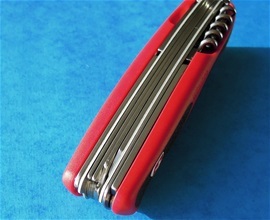 I have used Victorinox, Wenger and Leatherman tools with success. It is important to rinse the tool after use around or in saltwater environments. Then use some oil. It is best with a bit too much oil and that the tool is dry before oiling. I use food safe oil! It takes some practice with using a plier for releasing a hook and to get the touch for it. When you get the practice then there are no need for any force, it is a matter of a small twist, push and guide. Why people need pliers in the outdoors. For fishing it is a very helpful tool to have and for maintenance it can be just as helpful. Have you ever done repair on equipment with cold hands? It is not easy. The pliers can be handy for use around hot metals or equipment. It is possible to grab an object with firm control. It can cut wire and you can use it for adjusting nuts and bolts. It is also an excellent pulling device because you can grab a part and pull with control. It can be used on boats, bicycles, weapons and the list goes on and on. What is extra interesting is that a plier that in many cases are looked upon as a tool for hardware can also be used for traditional uses like fishing and cooking in the outdoors. Many wonder and feel that a set of pliers are a foreign device in the woods or on the islands. It is not! Another advantage is the use of the pliers for bending things and to save the hands from damage. There is probably or could be a limit for how much cold a tool can take, it can be held close to the body for heat but not touch skin if you are concerned. I have not ever seen any trouble yet with them. I believe the Wenger pliers are not the strongest out there but it performs for what it is intended for. 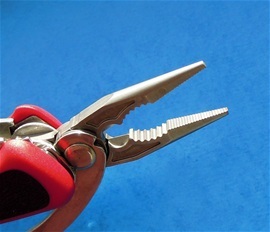 The construction of the pliers and the lever handle is impressive for use and it is gives a good control and reach. 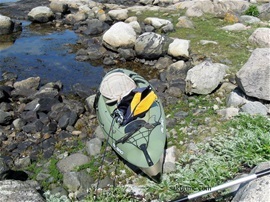 in the summer everything is bliss because you can sit in the kayak with just a shorts and life jacket. The water temperature is very good. In the early spring it is the complete oposite. I have used a few different gloves and it is love hate relation for sure. If the water temperature is very low and the wind is present then it does not take long before the hands are starting to get difficult and affect the fine control needed if you do not use gloves. The hands will get hardened and be able to take more cold but at one point the hands will be affected. The use of gloves can be a nightmare with a fishing rod and reels. It takes away the fine control and the hooks got that tendency to hook onto the gloves and so on. One takes on and off the gloves and it is just a mess. It is the same with a Multi-Tool and gloves. It is difficult to get the fine control. It is pretty easy to use the pliers, saw and blade that sad. To open the screwdrivers and smaller functions the gloves comes off. For fine work the gloves must be of. If the water temperature is low and the wind is there your hands will be cold but the metal on Multi-Tools will be colder and it does not take too much cold before the metal get stuck on skin. It is no problem if you are aware of this. No matter of any negative factors the Multi-Tool is a great thing to have with you. I was wondering if the plier's wire cutter can cut a braided fishing line (not nylon). Hi Yuri! Thanks very much. Braided Fishing line is best cut with scissors or the blade. Filamented/braided line will get flat and be cut eventually.